Yesterday, for the first time ever, I blended spices for a curry. Usually I buy a packet of paste and toss it in along with the coconut cream. After Sam's rave about growing up in a household with jars of Sharwood's curry powders I decided it was time I made the effort to make a real curry. Needing to follow a recipe, I chose a Sri Lankan curry powder from Taste magazine. Driving through Sandringham on Saturday on route to the Halal Bihalal gathering I called at a spice store to buy the necessary spices. Yesterday I measured out all the seeds and proceeded to toast the spices. When I got to the coriander seeds I discovered it was crawling with little insects. I remembered seeing coriander seeds in little bottles at my local supermarket. Much more expensive than buying in bulk but cheaper than driving all the way back to Sandringham to replace the infected seeds. A brisk walk to the supermarket and I was soon back with two very expensive little jars of coriander seeds. Last night I made a curried chicken recipe using some of the spice blend. What a difference a little effort makes to a curry. I'd have liked the meal to be a little hotter but at least the blend gave an authentic taste to the curry. Today the house still smells like an Sri Lankan Curry house but I rather like it. Put the roasted spices into a grinder together with the cinnamon stick, broken into pieces, cloves, cardamom seeds and curry leaves. Blend on high until finely powdered. I used my blender as I don't have spice grinder. You could use a mortar and pestle. 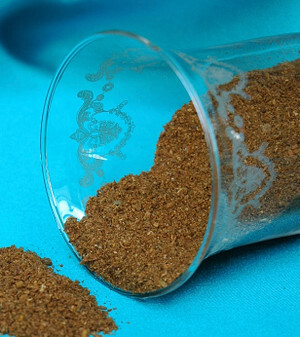 Store the curry powder in an airtight container in a cool place.